Singapore has undergone a huge transformation in the last few years. If you have been to the Marina Bay 10 years ago and come again now, you won’t even recognize the place. Yes, it was a metamorphosis! The newly reclaimed area at the Singapore harbor front is now a place with all sorts of fun and entertainment. Well, Singapore is not big – and I visit Singapore at least 1-2 times a year. I have seen the key sights in the city and there was a time I decided to stay within the Marina Bay, hang around the Marina Bay Sands resort, enjoy the infinity pool and discover Garden by the Bay. The Garden by the Bay used to be a new attraction in town (not so much now). Yet, I am still impressed by its design as I enjoyed the view and breeze on the balcony of one of the Marina Bay Sands Suites every time I am in town. The Garden by the Bay has three major attractions – the Supertree Grove, the Flower Dome, and the Cloud Forest. There is more like the FarEast Organization Children Garden, Satay by the bay and the Meadow. What I love about the Garden was the easy access. It’s closely connected and in walkable distance to the Bayfront MRT Station and the Marina Bay Sands (the connecting bridge is separated from the hotel though). It is more than a typical botanical Garden, the park has a theme and it is a trendy place with exciting design elements that make the garden lively and multi-dimensional. posts that dressed like a tree. Look up in awe at dramatic plant displays, and the Skyway is a 22-meter high bridge connecting the trees, offering a bird’s eye view of the garden. When night falls, the Supertrees were quite super – they come to life with a spectacular light and sound show, powered by the solar power saved up during the daytime. Very very Avatar, and very very green. From the balcony of my hotel room, I noticed two futuristic greenhouse-like structure was erect on the waterfront. Visitors could decide their own ticketing combo; first-timer should usually visit both places (Flower Dome / Cloud Forest). The Flower Dome did surprise me in a certain way. Apart from flower arrangements, it has a well-organized succulent collection that was quite special and new to me. Wandering amongst thousand-year-old olive trees and unusual Baobabs of the cool-dry Mediterranean and subtropical regions, you look into the world from a different perspective. So when we enter the Cloud Forest it was just in time for misting!! The tower was spraying mist all of the sudden and I felt like I was walking through a mysterious fairyland. The cloud forest is a 35-meter man-made mountain with waterfall; visitors could explore the highlands amidst orchids, pitcher plants, and ferns from the cool-moist Tropical Mountain region. Walking in and out of the mountain was like a hike – and inside the mountain, there was exhibition introducing the formation of rocks, the difference of stalagmite and stalactite, etc! The day I went to the museum feature a Hermes exhibition that was lucky: FREE! The museum’s exhibition floor (2/F) changes its theme periodically and the one that I missed was the Harry Potter exhibition. It was a …. VACATION! Therefore, some pool time is definitely necessary (no matter its day or night). One of the coolest things about the pool in MBS is that it’s an infinity pool, and it’s built on the 59th floor. What’s more, it has a view of the entire Marina Bay, including the Singapore CBD. So, you could soak yourself in a pool, enjoy some sun with a Pina Colada in your hand, and enjoy the view of the entire Singapore City in the same spot. The pool is only limited to the hotel guest – which is thankful for me. Actually, it’s busy enough with just the hotel guests, but don’t worry, they have plenty of chairs. The view has it’s beauty day or night. I can’t really choose, except it’s raining. The upper part of the sky deck is exclusive to hotel guests, too. I was surprised to see quite a lot of visitors from Japan and Korea stayed at the hotel during my stay. The only thing that I would “consider” seeing again would be the fountain show at the waterfront, with the Singapore’s skyline as a background. However, it was raining and it’s yet another light and sound visual stimulation that not very much special. If only you were at Marina Bay Sands – you could consider. There are two shows every night, and three for the weekends. i Light Marina Bay is Asia’s leading sustainable light art festival, held in the Marina Bay. The festival inaugurated in 2010 and owing to the success, the event takes place biennially in 2012, 2014, and 2016, and will continue to take place annually! There were more than 22 light installations scattered all around Marina Bay in 2018 (from 9 March to 1 April), while most of the exhibits are created and design by contemporary artists in the region. Like “Dancing Grass” by Yuree Hong and Siyong Kim, Light Play by NTU’s School of Art, Chandelier of Spirits by Living Spirits, and Octopoda by Amigo and Amigo. It was a really beautiful night all visitor enjoyed a wonderful walk along the bay; my friends also found got some nice designer goods (and name cards) at the flea market by the bay as well! I visited Singapore last year after an absence of 23 years and everything had changed, yet I somehow enjoyed it so much more than before. I especially loved the Gardens by the Bay and would definitely go there again to see the Flower Dome in the daylight. Thanks Razena! Wow that was a long time ago,a and yes, the country changed really a LOT for the last 20 years. I am sure you would like it looks completely new. I would love to see Gardens on the Bay and walk across the bridge and around the cloud forest too! What an amazing exhibit, and so pretty too! My husband used to travel to Singapore for business but stopped before the Gardens on the Bay were completed. He was sad he missed it! I would love to see the flower dome and the i light. They both look really cool and the flower dome is beautiful. That is cool that you go to Singapore 1-2 times a year. I hope to get there one day soon. I haven’t been to Singapore yet and the Supertrees and Cloud Forest are high on my list when I go. Such a unique experience, and I’d have to go at night for the Avatar effect. 🙂 You mention that the light show is sustainable. Is it solar powered? You are right. 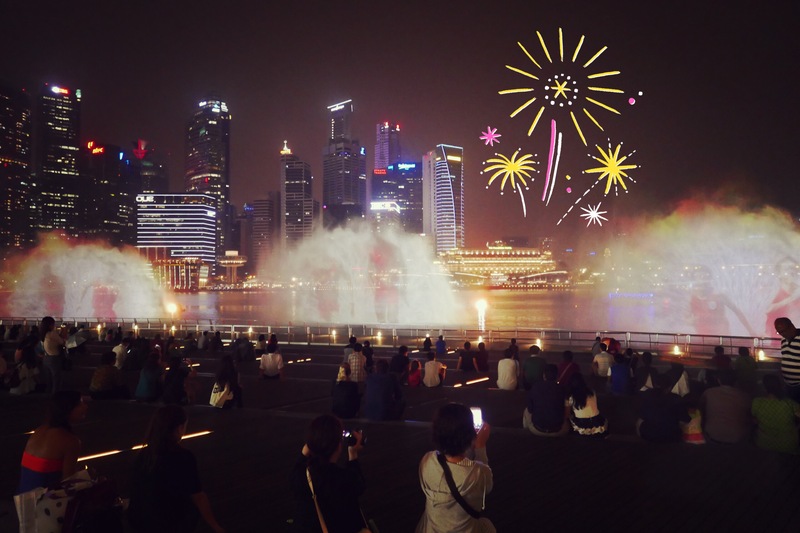 The recent transformation has turned marina bay such a beautiful place to visit. I really love garden by the way. It’s such a pleasant experience to stroll along the lit up trees. Your pictures are beautiful! I have never been to Singapore, but your pictures make me wanna go! The Infinity pool and sky deck look unreal! Thanks Kayla, I think you will enjoy the pool! Singapore is so beautiful. I would love to stay at Marina Bay Sands, it’s like a dream! Also, I like the design of the Garden of the Bay. Thank you whisperwanderlust ~ 😗 and yes, MBS is amazing! Visiting Garden of the Bay is on my bucket list! What an incredible part of the world. Great post, thanks for sharing 🙂 Happy travels! Thanks Carmen – the design of the garden is really smart and I appreciate the heart to preserve and also showcase the incredible nature environment ~ I would recommend it! I’ve always wanted to go to Marina sands, and of course the supertree grove. I’ve never been to Singapore, but have big plans to go next year. That breakfast looks delicious! Great Natasha and thanks for dropping by, let us know how you feel after your visits! Cloud forest looks amazing. Was it expensive to get into? This is definitely now on my bucket list! Great to know that Maddy! It’s not expensive and actually it’s a package combo for visiting all three attractions in the Gardens of the Bay, I think you will like it!